Grandson Mitchell, now a teenager, was here yesterday after school. I was helping him with his science project. He had to make and decorate a cake that depicts a cell. After some research Mitchell came up with a plan. 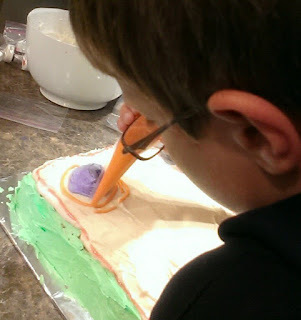 He needed a rectangle cake and many colors of icing. Light, Medium and dark purple, pink, light and dark green, black, tan, orange, blue and yellow. See all those years of practice of decorating Christmas cookies has paid off. (See as early as 2008 here, and then later on here and here). He decorated this cake all buy himself. It's a cell. As you can see there are many parts. Who knew!! After the cake was done and we were all admiring the artistry, Grampie said he should have made a cake of his iPhone. "That's a cell!! " he said. Mitchell and I both thought that was hilarious. 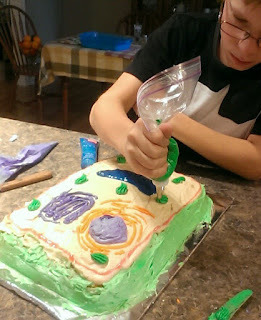 Mitchell is known as a comedian at school but I'm afraid, he might not have a got a good mark for the science class if he brought an iPhone cake.